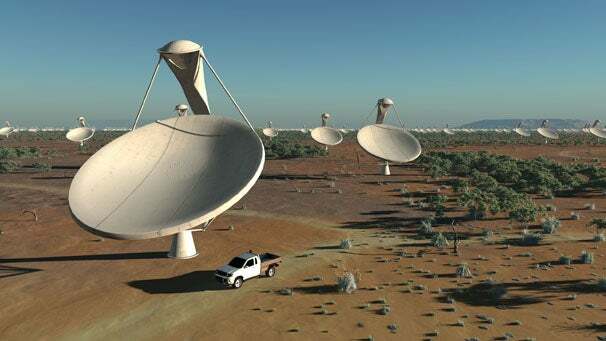 Australia is gearing up to launch its $2.1 billion Square Kilometre Array project in September. This array is made of 3,000 radio dishes spread across 2,000 miles. (Why it's called the Square Kilometre Array is beyond us--anyone know? Update: A response on Twitter provides the answer!) The plan is to essentially map the cosmos in its entirety, look for the center of the universe, and test general relativity. However that wasn’t enough feats for the Australian and New Zealand scientific venture, so now their going to launch the largest cloud computing initiative in history. With all the data the SKA collects, there's going to be a need for a lot of data crunching. The Aussies are already in the midst of setting up their Pawsey Center supercomputer hub, which can produce in excess of 200 teraflops of processing power, due to come online in 2013. The problem the southern lands run into is the fact that the 1.5 petabytes of storage in their network isn’t enough. So now the researches are looking to distribute the data to desktops and mainframes at universities and institutes across the around the world. The initiative is also open to any Joe Shmoe who is willing to give up a few gigs or terabytes of storage for access to the array’s data. Aspiring astronomists can help further a cause for space exploration and see the work too.